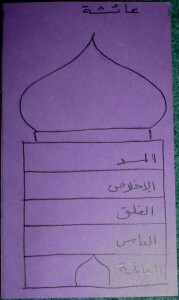 Incentive cards are an interactive way to encourage the child memorizing Quran. You can make various cards. 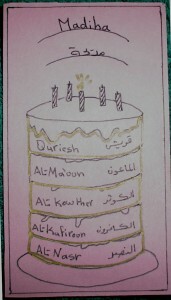 Put 3-4 surahs on each card. The card should show some way you can mark off the one they are doing. There are some examples below. 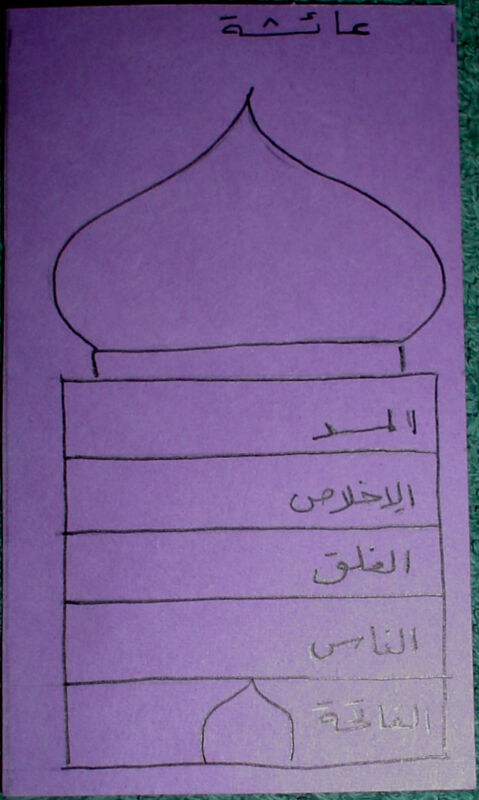 In the mosque example, there is a floor for each surah that you outline in gold felt pen or silver, then when the child has finished reciting all the surahs on that card, you out-line the dome in gold/silver. 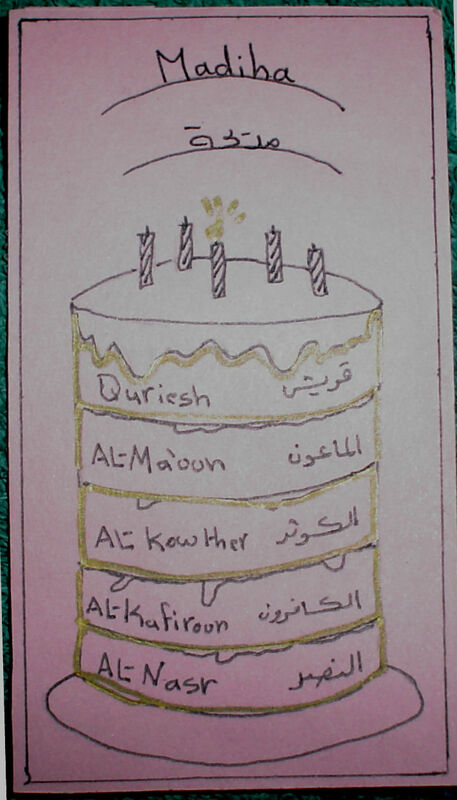 The next example is a layered cake, and when all the surahs are outlined, the candles get flames and rays. The third example is like a puzzle with shapes that either have a dot or an x or two of each. 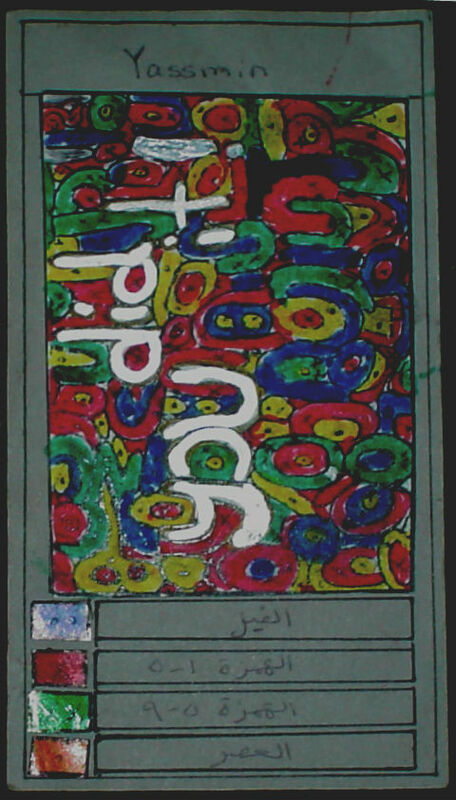 Each surah has a symbol and the child colors all the shapes of that particular surah when she finishes it. 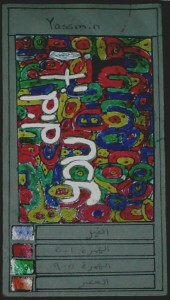 When they are all done, the blank spaces read “You did it!” and the teacher colors it in with her silver or gold pen. Other ideas: an elevator that stops on various floors; a lemonade glass with a straw and the child colors the level of the drink in the straw higher and higher; a door that opens to a heap of gold lumps. The idea is that concentrating on memorizing a few surahs at a time and seeing one’s accomplishment visibly and collecting the various cards does wonders for motivating them.